In this section I am providing detailed documentation of a few of the thousands of treatments I have performed, including in many of the cases the radiographs and very close up un-retouched photographs of my work. 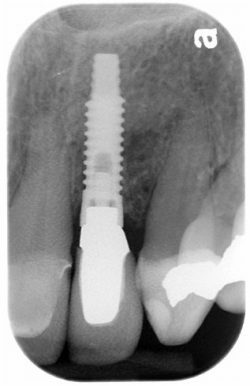 There are many practitioners out there providing implant therapies and I understand that it can be confusing for patients. The photographs you see are all mine and show work I actually performed. They are not illustrations, out of focus or taken from a distance. The work is not hidden under lips and in many cases I show radiographs as well so that those who understand this kind of thing can also see how the bone has healed around my work. I believe that a photograph is worth a thousand words. 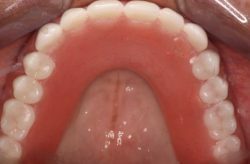 This is a common situation where one front tooth has broken and must be removed. In this situation there was also a lot of gum recession on the upper left and a smile that wasn’t everything it could be. Dr. Arvanitis removed the tooth, placed the implant at the same time with a temporary tooth and then performed gum grafting to alleviate the gum recession. 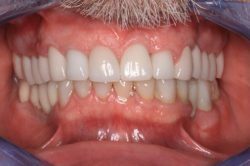 After a few months of healing all four front teeth were restored with matching porcelain restorations. Can you even tell which one is the implant? This young lady presented with a very challenging cosmetic situation. 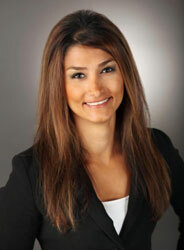 She was missing her lateral incisors and wanted a perfect smile. To make things more complicated, much of the bone and gum in the area of the missing teeth had also been lost and required reconstruction as well. Dr. Arvanitis replaced her missing teeth with dental implants, performed bone augmentation, gum recontouring and a smile makeover with porcelain restorations. 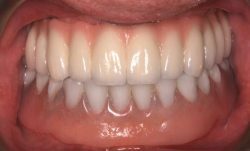 The hardest thing to achieve is perfect gum symmetry such that the implants look indistinguishable from the natural teeth. 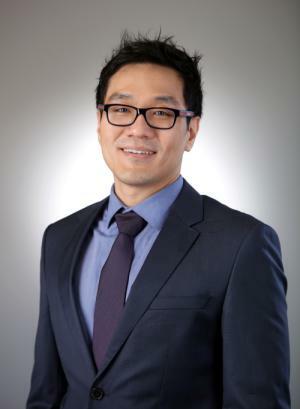 Dental implants to replace missing front teeth. Full reconstruction with dental implants. This patient presented with failing upper teeth and malformed upper and lower jaws. 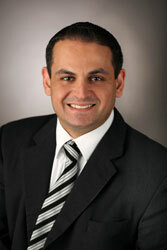 Dr. Arvanitis removed and replaced all the upper teeth with dental implants. He extensively re-shaped the upper jaw, reconstructed the sinuses and completely re-built the lower teeth as well. On the upper final photo it is important to note that her gums are her own- not part of a denture. She has no removeable teeth. Panoramic radiograph showing the implants. This patient presented with no teeth on both the upper and lower and had been wearing dentures unhappily for may years. 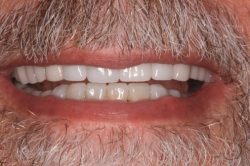 His treatment involved restoring the upper teeth with 6 implants and a non removeable porcelain bridge. 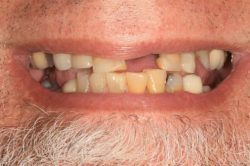 On the lower he opted for a removable bar supported over-denture. 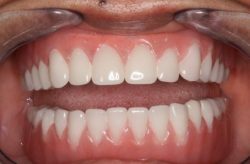 Full mouth reconstruction with some implants to replace the missing teeth and porcelain restorations on the remaining teeth to perform an ultimate smile makeover and full bite reconstruction. Smile makeover with a dental implant and porcelain veneers. Note the perfect gum symmetry. 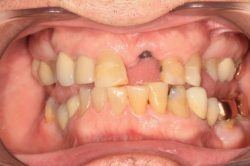 This is the most difficult thing to achieve with dental implants. Teeth in a Day. Loss of all upper teeth. 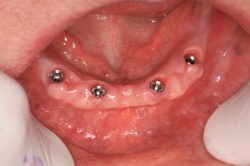 Immediate placement of 6 implants with temporary non removeable fixed bridge. 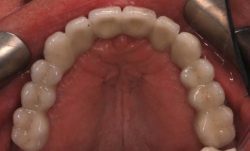 Final fixed non removable porcelain bridge is shown here. 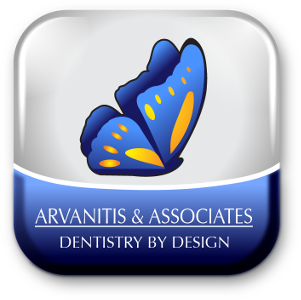 Unlike others who perform Teeth in a Day, Dr. Arvanitis’s techniques do not involve the removal of bone to accommodate a fixed denture. This patients gums are his own- not part of the prosthesis. This makes it easier to clean, more conservative and more aesthetic. Smile makeover with dental implants and aesthetic gum recontouring to eliminate the undesired gummy smile. 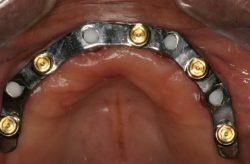 This is an example of an implant bar over-denture prosthetic. If you don’t mind wearing a denture then this is the ultimate denture system. The bar is fixed in place and attached to 4 implants. The denture sits on top of the bar. All of the chewing force is supported by the implants and the bar, not the gums. This prosthesis allows patients to function with almost the same force as they did when they had teeth. 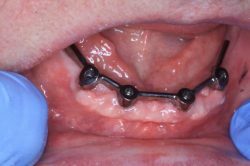 In fact people bite so hard that they would break the denture if we didn’t reinforce it with a metal framework. 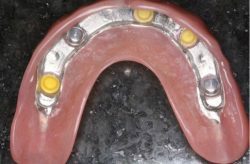 For added comfort all Maxillary bar over-dentures are fabricated with an open palate. Of course aesthetics are high as well!